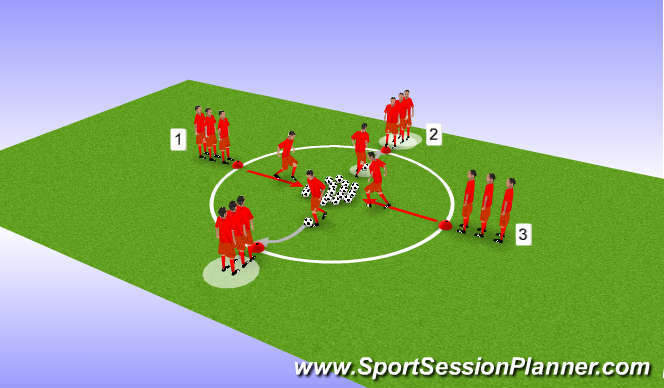 * Each team lines up on the cone with the balls in the middle. * Explain they are Robin Hood and the balls in the middle belong to the rich. * The first player of each term..run out put their foot on the ball and turn out and then dribble the ball back. They can then either pass back to the partner who stops it next to the cone or they stop it themselves. 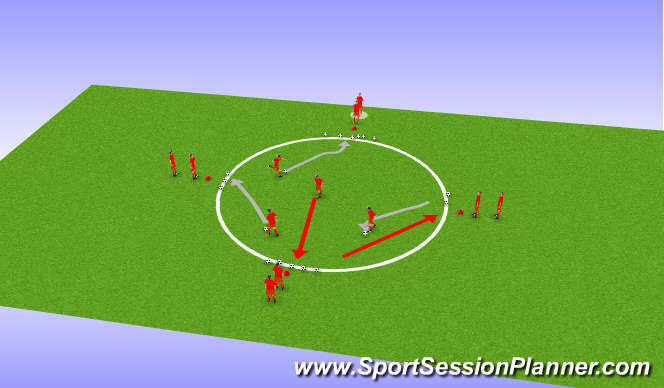 * Each player takes it in turn to repeat this process until all the balls have gone. Now that each team has collected the footballs get them to put them in a neat line in front of there cone. * Explain that the team with the most balls are now the rich and they must now steal from them. * Same as before each player comes out one a time and steals from another team. * Give them a time limit of 3 minutes to steal as many as they can...then declare a winner. * If you are wanting to feel a little adventure allow the teams 30 seconds where they can all steal a ball at once. If the ball is in transit at the end of 30 seconds this does not count.